Before my work experience I’d always wondered how a greyhound was trained to chase the lure. I know some people say you can’t train a greyhound to do anything – I beg to differ – but that’s a topic for another blog post! Horror stories tend to abound about how greyhounds are prepared for racing at the track or how they are trained to chase the lure. I'd like to share my experiences here...You may have heard that live rabbits are used to encourage the greyhounds to run. If this does happen, it certainly didn't at the kennels I did my work experience at. It shouldn't happen for several reasons: (i) it’s cruel (ii) it’s illegal (iii) it’s against racing regulations (iv) any trainer caught doing this will face prosecution (see: Greyhound Board of Great Britain website) It also wouldn’t serve a real purpose. At the track the greyhounds need to chase a mechanical lure, not a live rabbit. 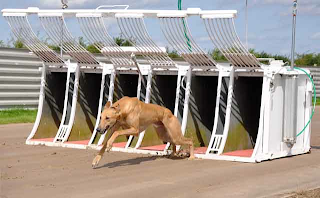 At Jane’s kennels, there is a purpose built, state-of-the art schooling track with the sole purpose of assessing a dog’s suitability to racing and helping prepare dogs for races. 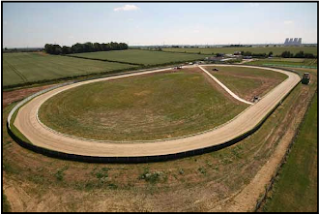 The track is 440 metres in circumference (you can read more about the track here) and attracts owners and their dogs from across the country. Jane’s reputation in schooling greyhounds in a positive and kind way, precedes her and a number of her kennels are filled with greyhounds whose owners have brought them to Jane to be schooled for racing. The training element of my degree focuses on 100% positive reinforcement (R+) training methods and I was interested to see how R+ could be applied to the track. Jane already uses many of the methods that we would use with our own pet dogs for training. Only raising one criteria at a time such as distance, duration and distractions; never setting up a dog to fail; rewarding a dog for the right behaviour and NOT punishing a dog. So how does a greyhound begin to be schooled? Well, it depends upon the age of the dog and their experience. Young pups/adolescents certainly aren’t forced into traps the first time they come to the schooling track. 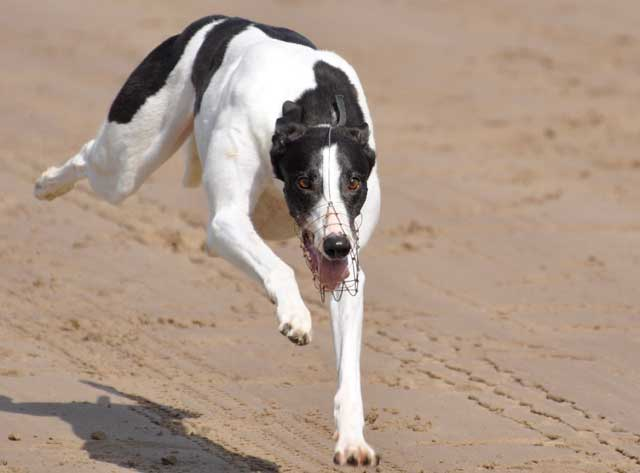 When a pup is old enough, he/she is brought to the track to assess whether he/she has a ‘keenness’ for racing. What this means is ‘is the dog interested in the lure?’ and does he/she appear keen to chase it? The pups are walked into the grassy centre of the track (not the sand track that the greyhounds race on) and, just like you’d speak to your pet dog, encouraged to look at the lure as it whizzes around the track (normally followed by a greyhound that is training). It was interesting watching the reactions of the puppies. Some were visibly excited and very interested in the lure, whilst others were less so. 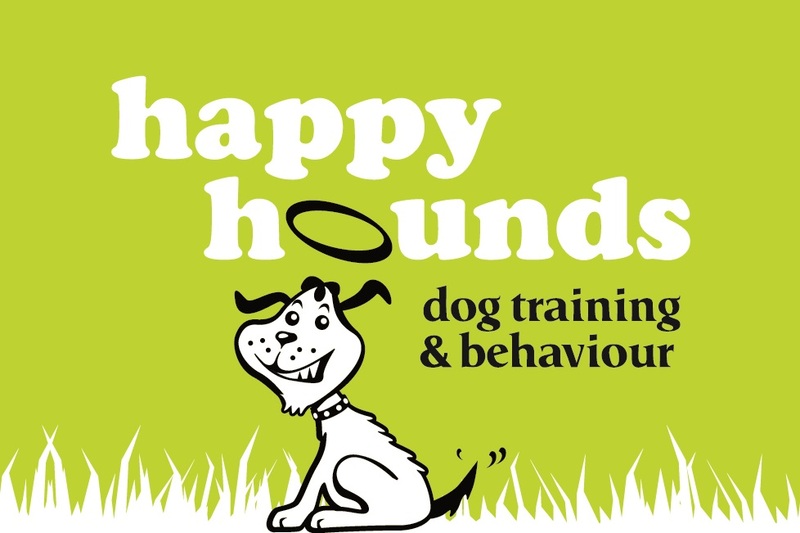 Each puppy has several of these sessions before progressing on to ‘hand slipping.’ If a dog doesn’t have sufficient chase instinct, he/she is rehomed via the RGT (Jane has close links with Midland RGT), one of the local greyhound charities or with his/her owner. I was also interested in watching the puppies’ body language for signs of excitement or stress. Again, this varied with each dog. The vast majority appeared to be excited – loose wagging tails, relaxed bodies, bright and keen eyes. Some dogs did show some signs of stress – tongue flicks, nose licks – but not to an excessive degree. I have seen dogs out on walks, at ‘fun’ dog shows and other dog competitions exhibit more severe signs of stress. Hand slipping a younger dog takes place on the straights of the track. As the name suggests, the dog is held by the trainer before being released to chase the lure. This way builds up the dog’s anticipation for the lure, as the trainer will, initially, hold the dog facing the lure and just as the lure approaches, will turn the dog and release him/her. There is definite skill in managing the release of the dog to best judge the speed and distance between hound and lure. From all the dogs I watched being hand slipped, the majority seemed to enjoy the chase and pursuit of the lure. Each dog goes through the hand slipping stage several times, with gradual increases of distances, before training for starting in the traps begins. I must admit, as I’m slight claustrophobic, I was very interested to see how dogs were trained to enter the traps. Again, I suppose it is because the vast majority of things I have read have all been negative, suggesting rough handling of the dogs. However, at Jane’s kennel this isn’t the case. Just like an experienced pet dog owner, who understands the importance of desensitising dogs to new objects such as a head collar etc, the greyhounds are desensitised to the traps. To begin with, the dogs are encouraged to enter and leave the traps, with both doors open. This involves two people – one at the back, to position the dog, and one at the front to lure the dog through. Once the dog has passed through the trap this way they get rewarded with lots of a fuss and/or a treat. This is repeated many times before the dogs start running from the traps. For some dogs, and to create positive associations with the traps, they’re fed some of their meals in the traps. When the dogs start being schooled from the traps they being to wear a lightweight racing wire muzzle. 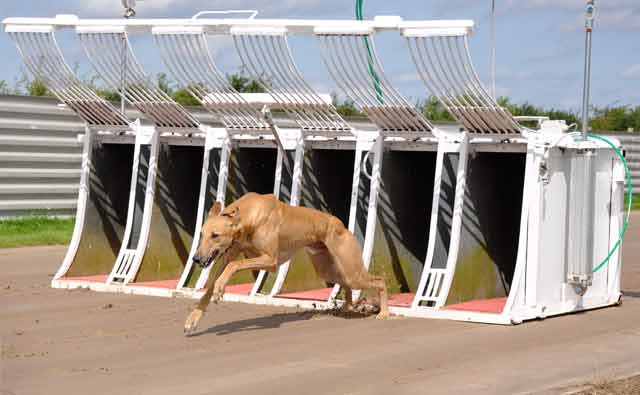 The muzzles are to help prevent any injuries at the track and to stop the dog from damaging the lure at the end of the race. I was taught how to guide a greyhound into the traps and have to say I was a tad nervous to begin with. Firstly, the hound is lined up outside the trap he/she is racing from. The door is opened and then the collar and lead are removed and the dog guided in by the handler. The guiding in involves holding the dog and lifting him/her gently into the trap. Once in the trap, it is only a matter of seconds before the doors are released and the dog begins to race. Dogs are not kept in traps for longer than is required. The schooling from traps takes time and patience as each dog is individual. To begin with most dogs will do solo runs from the traps. When a dog has had sufficient experience of this, he/she may then take part in a training race paired with another dog. This helps them get use to the experience of racing against other greyhounds. When they initially start running from traps the distance is kept shorter and gradually built up. The speed and distance of the lure from the dogs is also kept under tight control, with the trainer being in constant radio contact with the operator in the control room, whose job it is to control the opening of the traps and the speed/distance of the lure. All this takes a different amount of time depending on the dog. 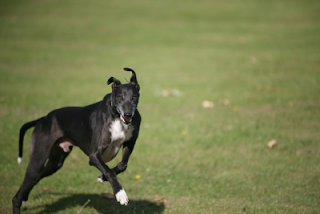 When the dog is ready he/she will then make the transition to a trial at a racing track. From my work experience observations, I’d also like to dispel a myth I’ve heard that dogs are forced to chase. The simple fact is that if a dog doesn’t want to chase it won’t. They’re not forced to chase – for many it’s genetically hard wired. They are a sighthound and for most greyhounds the sight of a fast moving object in the distance, is enough to stir this instinct. However, some dogs have a low chase instinct, some are too slow, some prefer playing with other dogs and some, when they realise that they don’t really stand a chance of catching the lure, may give up and turn back and run towards the trainer! Contrary to some beliefs this does not mean that all these dogs are ‘culled’ or resigned to the scrap heap. Certainly, in the case of Jane’s kennels, any dog that isn’t suitable for racing is either retired and rehomed with his/her racing owner, or rehomed via one of the greyhound charities. The schooling process was fascinating to watch and to see how individual hounds responded to training. Many of the R+ training techniques that we use as a pet dog owner are used along with playing to the hound’s natural instincts. I hope you find my work experience observations interesting - please do feel free to comment and share your views*...I look forward to reading them. *Please keep responses polite. Everyone is entitled to their views. Any abusive posts will not be tolerated and will be removed. A fascinating post, thanks for taking the time to explain it in such detail. I hope other trainers are as kind as Jane, and I think the tendency is moving towards that, but I think there are still some who are less scrupulous. Thanks for your comments & for sticking with a long blog post. I can only post about what I observed & I hope the blog gives a balanced view. It's certainly not all rosey in the garden for greyhound racing, however the good trainers in the industry don't seem to get recognised. I'm hoping that the trainers who give the industry a bad name are being squeezed out. Thanks for sharing your experience. Its nice to know some trainers are using positive reinforcement training methods as the only ones I've seen have subscribed to old fashioned 'punishment' training :P.
Do all the dogs that aren't suited to race get re-homed by the RGT? I ask bc I volunteer with another greyhound re-homing organization and i) there are so many dogs that aren't cut out to be racing dogs that we have waiting lists miles long for dogs to come into the rescue and ii) some trainers would rather put the dogs down instead of waiting (and continue paying for the dogs food, etc) to get into the rescue. Jane and her training methods certainly derserve praise. I think (and hope) that the old fashioned approaches to greyhound racing are being squeezed out and more trainers are taking Jane's approach. For the issue of rehoming, I think it depends on the trainer... Not all dogs will be rehomed via RGT (Jane has dealings with other greyhound charities too)but I can say that Jane does keep on ex-racers (some are living out their retirement with her) at her own cost until a place with a rehoming charity can be found. I know that GBGB are keen to bring greyhound welfare higher up the agenda and when I was at the track, I met the Greyhound Welfare Officer - but there'll be more about that in my next post..
A very interesting insight into how greyhounds are trained at this particular 'school' - thank you for sharing your experience. You mention several times that if a dog isn't suitable for racing they are rehomed by 'one of the greyhound charities'. Surely you can't think it's right that completely volunteer run charities who work hard to raise every penny of funds they've got should be left picking up the pieces after the racing industry? This is hardly responsible at all. I also wonder if you are aware of the statistics reflecting exactly how many dogs are discarded as 'unfit for purpose' compared to those that go ahead & have a 'successful' racing career? Sadly I think you will find the reality is that (regardless of what happens at the specific kennels you are completing your work experience at) many of these dogs DO end up culled, abandoned or passed into the hands of those who race them at the completely unregulated flapper tracks. I agree with you that greyhounds (& sighthounds in general) love to run. & when racing round a track is the only outlet they are given for this desire then, yes, of course they will appear to enjoy it! However, give any greyhound the choice between running free in a soft, open area with grass & interesting smells & the freedom to run at the pace of their choosing & slow down/pause at their own will & I don't think you will get many choose the track & the mechanical lure anymore! I hope it doesn't seem like I'm attacking your post. I am genuinely interested to see what you have learnt during your experience. But I just don't think you should generalise too much from it about the greyhound industry the its treatment of these dogs at large. Thanks for your feedback on my blog post. I’ll try and answer your questions as best as I can. The industry does contribute to the RGT, however it is my opinion that this contribution should be increased (I think it’s 1%). When I was at the RGT conference last year, there was also talk about getting the trainers to pay towards the cost of spaying/neutering and care. From my experience with a local charity, I know that some trainers pay a sum to the charity when they take a dog. I am aware of the statistics that are provided about the number of dogs that retire from racing annually and yes, I have witnessed and dealt with dogs that have been abandoned and suffered as a result. There is no excuse for these so called trainers that abandon dogs and GBGB and the law need to deal with them. My comments about enjoyment were purely based on watching the dogs’ body language. My 3 hounds love to run free but are especially stimulated by moving objects (after all their genetics are based in hunting moving objects by sight). One of the pups I observed was visibly excited by the lure – the speed & movement. I certainly don’t think you’re attacking my post and I welcome your views and experience and hope you will coment when my final post is published. I’ve tried not to generalise about the racing industry as the post only refers to what I saw at Jane’s kennels and it is only these observations that I can reflect on. I’m still working on my next post, which looks at what goes on behind the scenes at the track, and hope to publish this next week. Thanks for taking the time to reply (& to my other comment too). I think we're both 'singing from the same hymn sheet' as it were - there are good & bad extremes out there when it comes to everything, greyhound racing included. I suppose it's all about weighing the balance. I think it's fantastic that you are using your work experience as an opportunity to look further into this area & completely understand it is without your scope to generalise your findings in anyway. They are still interesting nonetheless & I really look forward to reading your next post.